The Scientific Applications and Visualization Group (SAVG) of ITL's Mathematical and Computational Sciences Division has developed an immersive visualization environment that can be used to gain increased insight into large, complex data sets. Such data sets are becoming more commonplace at NIST, as high performance parallel computing is used to develop higher fidelity simulations, and combinatorial experimental techniques are used in the laboratory. Immersive visualization environments allow the scientist to interactively explore complex data by literally putting oneself inside the data. Fully immersive computer graphics include one or more large rear projection screens to encompass peripheral vision, stereoscopic display for increased depth perception, as well as head tracking for realistic perspective based on the direction the user is viewing. 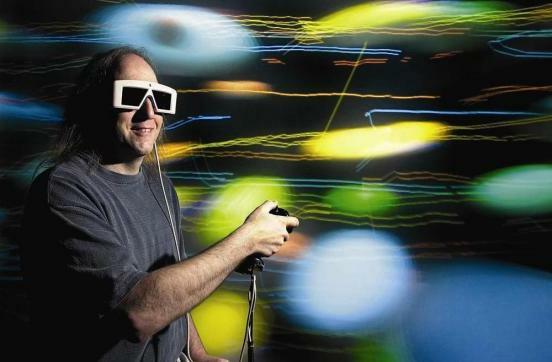 The ITL Immersive Visualization Laboratory (Gaithersburg Building 225/A140) is a RAVE (Reconfigurable Automatic Virtual Environment) from Fakespace Systems. The two-wall RAVE is configured as an immersive corner with two 8 ft. x 8 ft. (2.44m x 2.44m) screens flush to the floor and oriented 90 degrees to form a corner. The large corner configuration provides a very wide field of peripheral vision, with stereoscopic display and head tracking. The RAVE is driven by an Silicon Graphics Onyx 3400 parallel processor graphics super computer consisting of twelve 500MHz MIPS R14000 CPUs, 12GB memory and 3 Infinite Reality graphics pipes (visage.cam.nist.gov). The primary software controlling the RAVE is an open source system from Virginia Tech called DIVERSE (Device Independent Virtual Environments- Reconfigurable, Scalable, Extensible). DIVERSE handles the details necessary to implement the immersive environment. SAVG has developed additional tools and techniques for quickly moving research data into the RAVE, often with little or no special-purpose graphics programming. SAVG is interested in collaborating with NIST scientists who would like to explore the advantages of immersive visualization to their research. The best way to understand how the RAVE works is to see it first hand. A weekly "Open House" demonstration of the RAVE is currently being held every Friday from 2:00 pm to 3:00 pm, in the Immersive Visualization Lab, Building 225/Room A140 in Gaithersburg. These demonstrations are informal and anyone at NIST is invited to drop by on any Friday. The demonstration content and discussions will vary from week to week depending on the attendance. Note: The photo above is reprinted with the permission of Government Computer News, Copyright © Post Newsweek Tech Media Group. All Rights reserved.